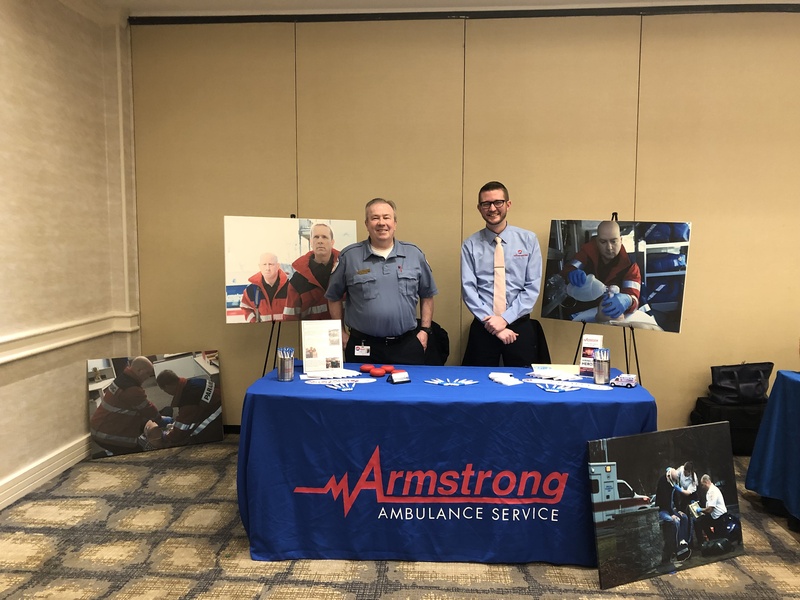 Armstrong Ambulance representatives attended a college fair held by the Massachusetts Department of Children and Families Wednesday. 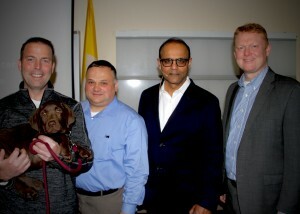 Our Armstrong Family Has Expanded By 4 Paws! 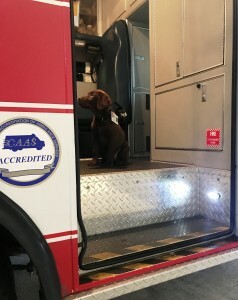 Willie has made himself at home at Armstrong Ambulance’s Arlington base. 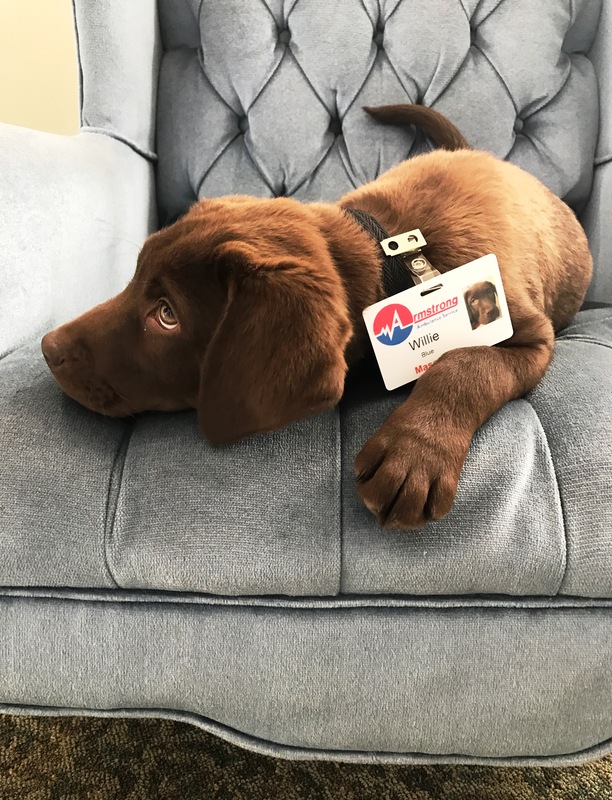 Armstrong Ambulance Service is pleased to announce that its new therapy dog arrived at headquarters last week. 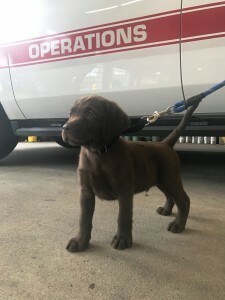 Willie Blue Armstrong is a 12-week-old chocolate lab who is currently working on completing his training so that he can fulfill his important role as the ambulance provider’s resident therapy dog. Willie was named for company founder Bill Armstrong, and his middle name is a nod both to Armstrong’s favorite color and the company’s ubiquitous blue blankets, which are part of his legacy and used to keep patients warm and comfortable. 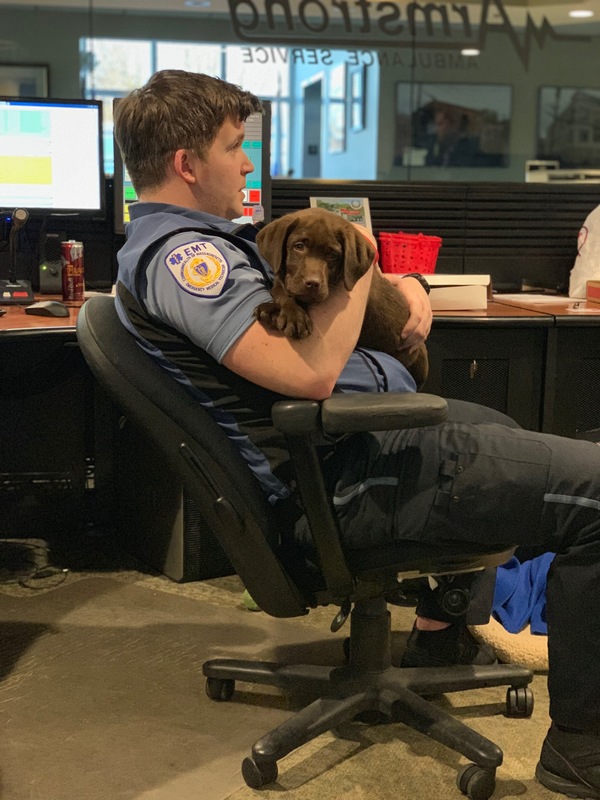 So far, Willie has completed two weeks of behavioral training, and will undergo more rigorous training at Fox Hill Farm and K-9 in order to ensure he’s prepared for his future responsibilities. 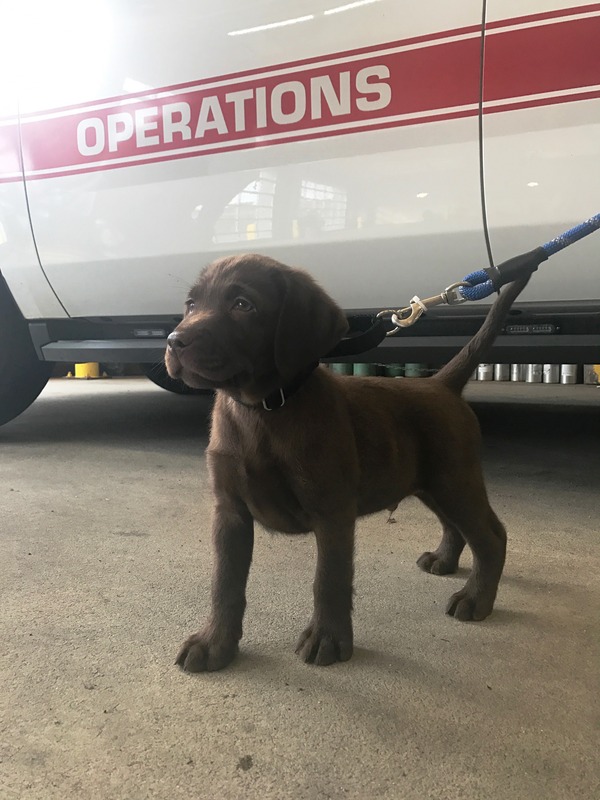 Willie will live at Armstrong’s Arlington base, where he is already receiving 24/7 care and attention from the staff, who have welcomed him with open arms. 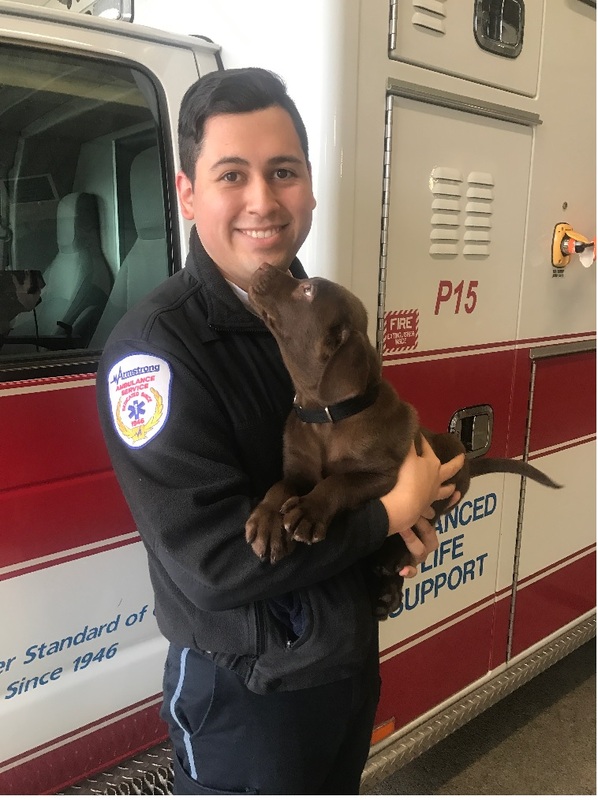 Once his training is complete, Willie will be charged with cheering up patients who are sick or injured, and will also make regular visits to nursing homes and assisted living facilities in the area. To see videos of Willie at Armstrong’s Arlington base click https://vimeo.com/321809569 and https://vimeo.com/321809550. Willie has already completed his first assignment by sending a letter of encouragement to a 7-year-old Wisconsin girl, Emma Mertens, who suffers from an inoperable brain tumor. 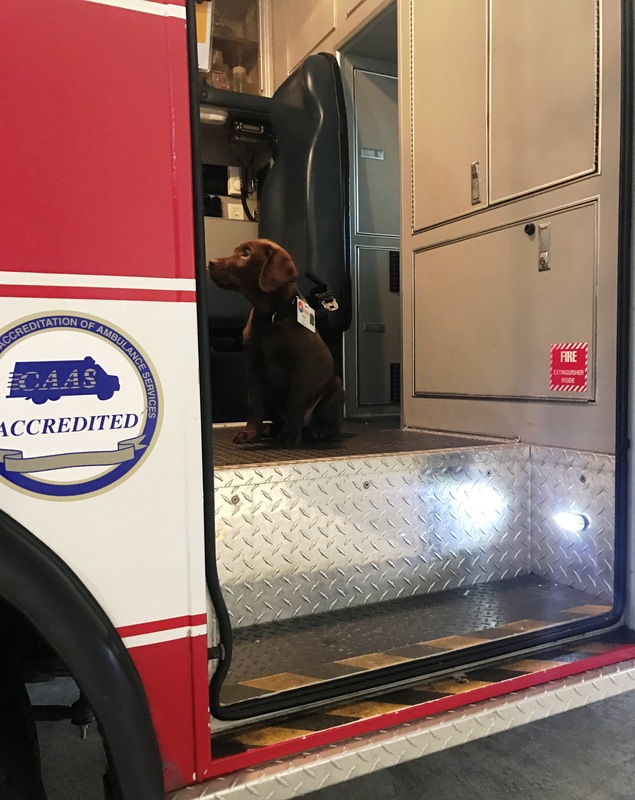 Mertens requested–and has received–letters from more than 50,000 dogs nationwide, including Willie. “We’re so excited to have Willie here on our team and watching him spread cheer and smiles to everyone he encounters is pretty amazing,” Armstrong CEO Rich Raymond said. 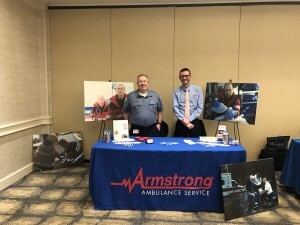 Willie sits with EMT/Emergency Medical Dispatcher Paul Gallagher at Armstrong Ambulance’s Arlington base. 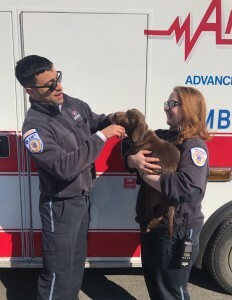 Willie gets aquainted with his new colleagues, Paramedics Dan Cardona and Gwen Bibby. EMT Rene Duarte holds Willie. 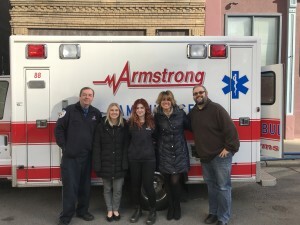 Armstrong Ambulance Service reports that Armstrong EMS personnel safely treated and transported a newborn baby boy and his mother to the hospital after the baby was delivered by his father in the back of the family’s minivan early Monday morning. 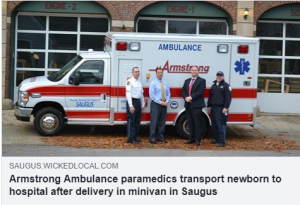 At approximately 1:35 a.m., Saugus Police dispatchers received a 911 call from a frantic man who told them that he was driving to the hospital and his wife was giving birth in their minivan. The baby had to be delivered in the van and was unresponsive and not breathing because the umbilical cord was wrapped around his neck. A Saugus Police dispatcher stayed on the phone with the father and had him remove the umbilical cord from around the baby’s neck and told him how to administer CPR. 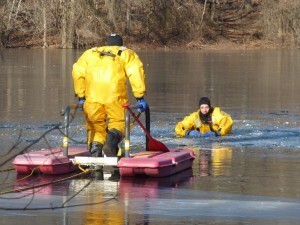 The baby began breathing and started crying. 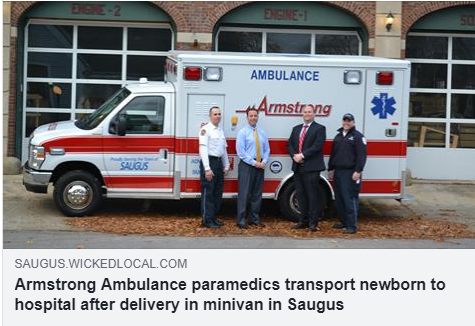 A short time later, crews from Armstrong Ambulance arrived and provided emergency medical treatment and transported the mother and the baby aboard the ambulance, while a Saugus firefighter drove. 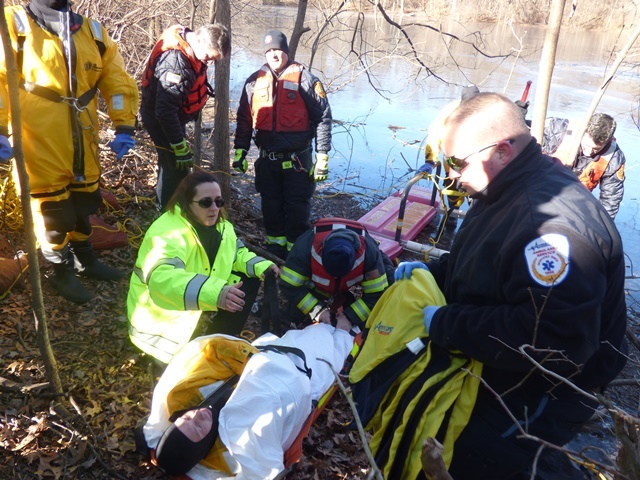 The two were treated by the Armstrong Ambulance EMS team and safely transported to the hospital where they were healthy and doing fine. This is an example of excellent teamwork by Saugus 9-1-1 Dispatch, Police, Fire and Armstrong Ambulance personnel. 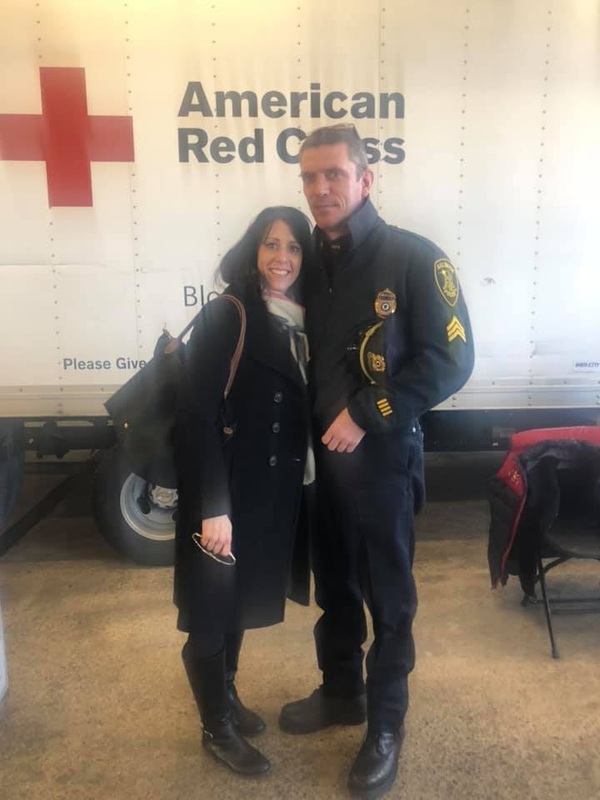 “Usually we like to transport expecting mothers to the hospital before the baby is born, but we are very happy that the baby and mom are both healthy,” said Richard Raymond, Armstrong Ambulance CEO. Armstrong EMT Melissa Pierce and Paramedic Wayne Gilbert speak about their actions after responding, treating and transporting a newborn baby delivered in the back of a minivan in Saugus. 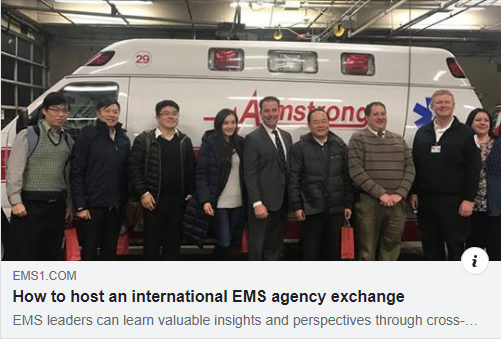 Also pictured is Interim Chief Ronald Giorgetti of the Saugus Police Department. 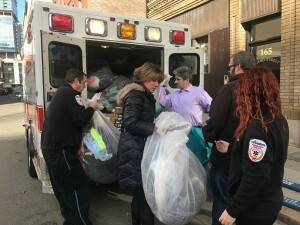 (Left-to-right) Armstrong Support Services Ed Kelly, Armstrong Provider Relations and Marketing Representative Katherine Aker, Armstrong EMT Nina Feinberg, Armstrong Chief Business Officer Meredith Lambroff and Bay Cove Human Services Communications Manager Joshua Wardrop meet and unload a special delivery to Bay Cove of donated winter clothing items out of Armstrong’s ambulance. On behalf of Armstrong Ambulance Service, we wanted to extend a sincere thank you to our employees and community members who so generously donated winter clothing items and supported our third annual Winter Warmth Drive. Thanks to everyone’s giving spirit and combined efforts we were able to donate over 900 winter clothing items to Bay Cove Human Services and give the gift of comfort and warmth in the New Year. 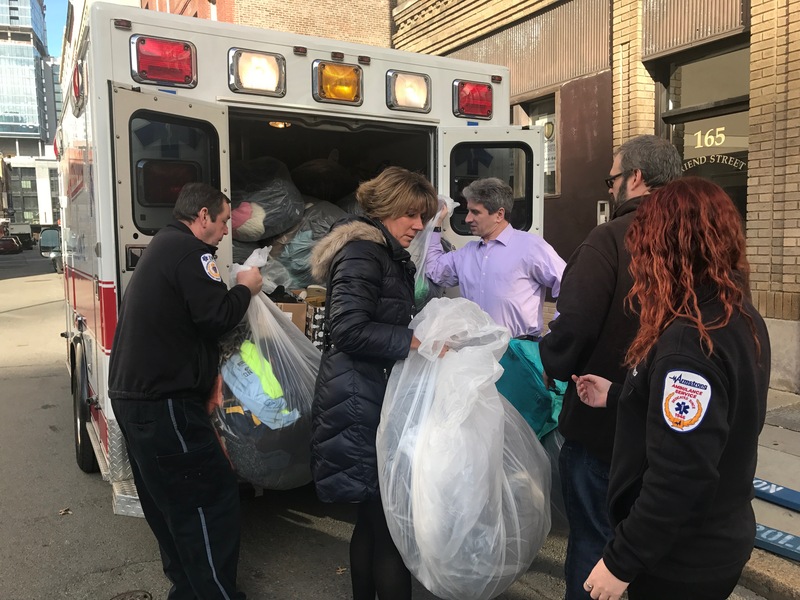 This year’s donations includes 224 pairs of socks, 134 coats, 52 sweaters, 84 pairs of pants, 90 sweatshirts, 47 shirts, 5 vests, 75 hats, 7 headbands, 52 scarves, 78 pairs of gloves, 12 pairs of shoes, 10 pairs of boots, 16 undergarments and 6 blankets. 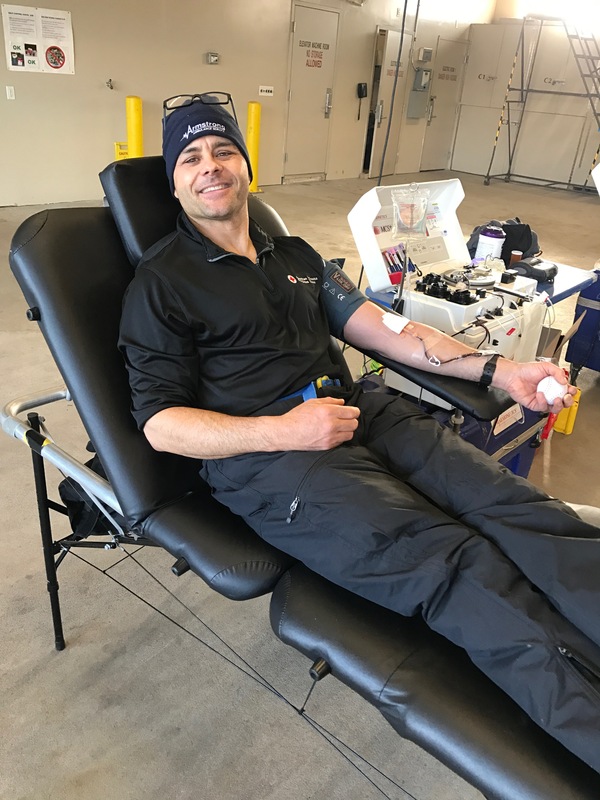 A remarkable cause such as this called for a grand delivery! 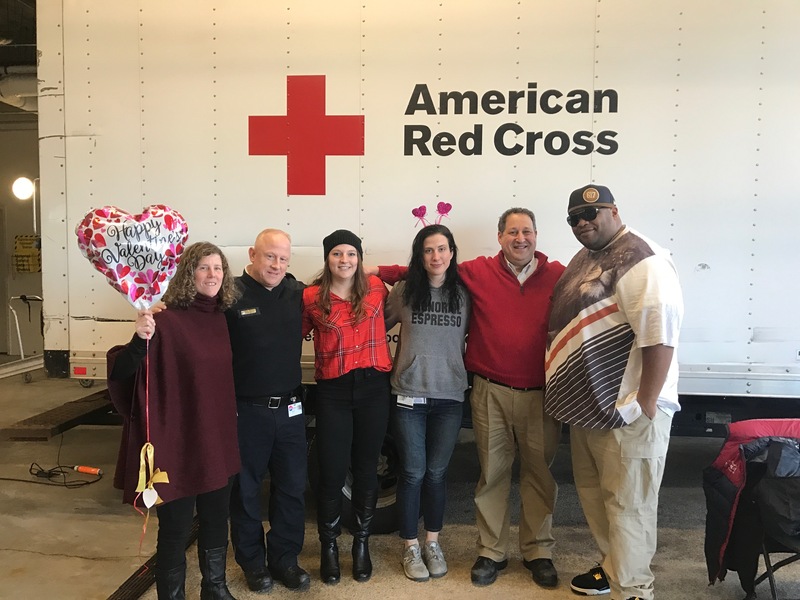 On Wednesday, January 2nd Armstrong organized a special ambulance transport and delivery to Bay Cove Human Services with all the donations collected over the past month. Bay Cove was so appreciative of all the donations and is looking forward to our continued partnership in the years to come. 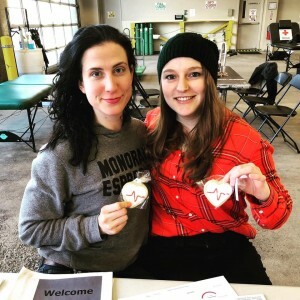 We also extend a big thank you to Ed Kelly and Nina Feinberg for all their coordination and help in making this great cause possible again this year. Bay Cove Human Services Vice President of Development Dave Hirschberg and Bay Cove Human Services Communications Manager Joshua Wardrop assist Armstrong staff members with donation drop off. 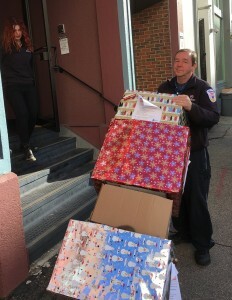 Armstrong Support Services Ed Kelly delivering boxes of winter boots and socks upstairs to Bay Cove Human Services dressing room. 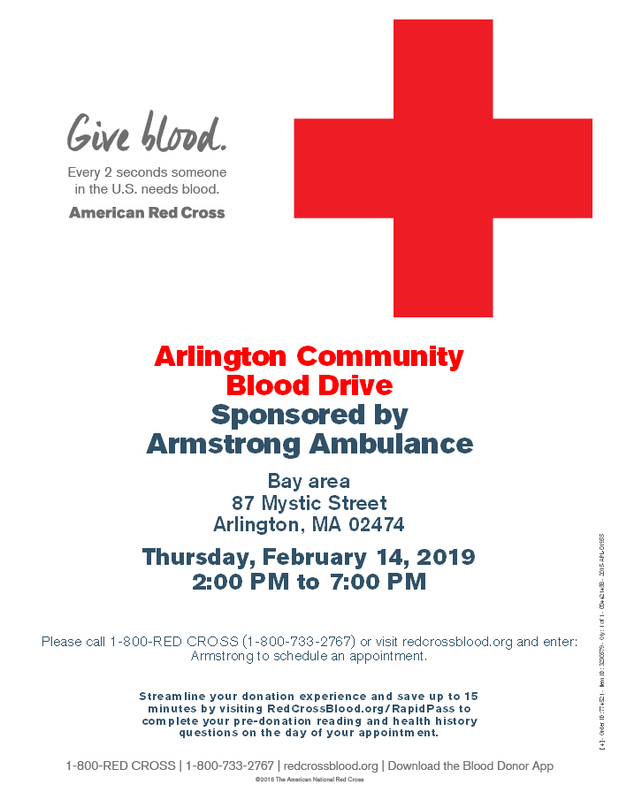 Armstrong Ambulance is asking members of the community to participate in its upcoming Valentine’s Day blood drive. 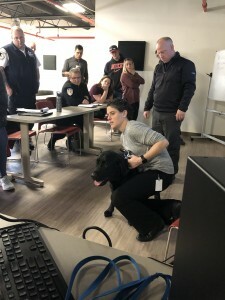 Thursday, Feb. 14, from 2-7 p.m.
Veterinarian Beth Eisenberg works with Comet, a black lab that came along for Armstrong’s training on K-9 first aid. ARLINGTON — Armstrong Ambulance personnel participated in a specialized training last month that would help them render aid to an injured dog in an emergency. 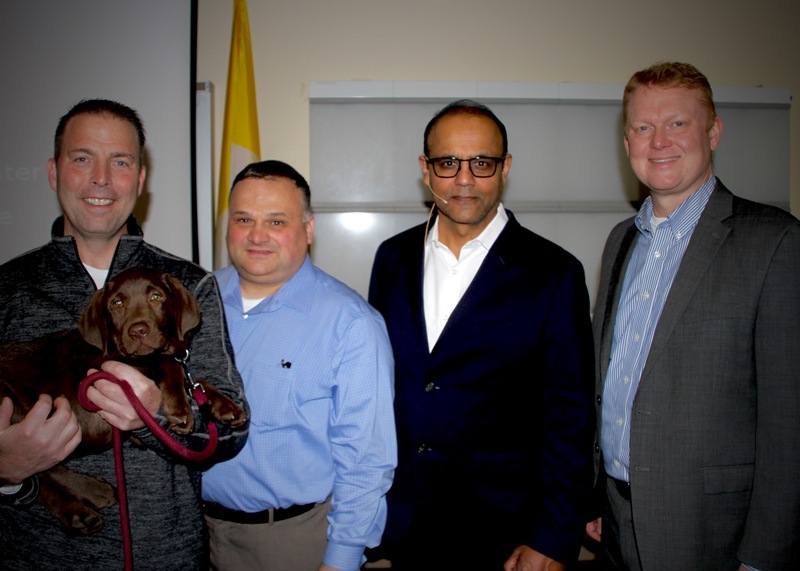 On Wednesday, Dec. 12, Armstrong welcomed veterinarian Beth Eisenberg from the Massachusetts Veterinary Referral Hospital in Woburn for an in-depth training session that would enable them to help an injured dog, such as a police K-9 hurt in the line of duty. Armstrong EMTs and Paramedics worked with a black lab to learn more about its anatomy and develop an understanding of how properly listen to its heart and lungs and locate its pulse. 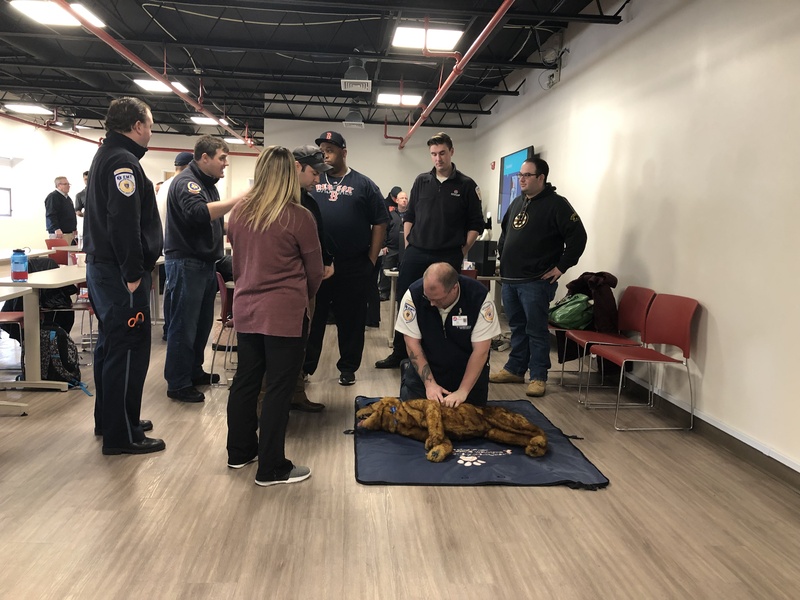 Staff members were also trained on basic handling of an injured K-9 — including providing safe transport using a backboard — and all of the critical skills they’d need to respond to various types of trauma, much as they do with human patients. 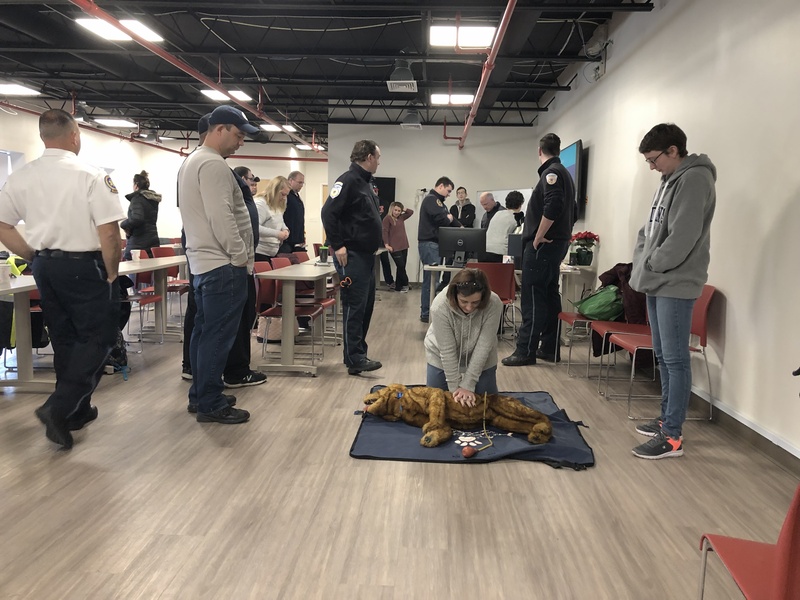 They also had the opportunity to practice CPR on a K-9 mannequin. While all Armstrong EMTs and Paramedics have undergone extensive and specialized training to provide aid to human beings, the course on K-9 first aid allowed them to have a baseline understanding of the needs of injured animals and how their first aid needs differ from those of humans. 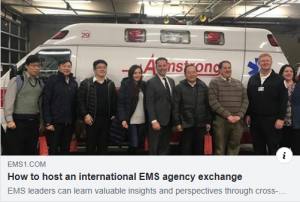 The course is part of Armstrong’s ongoing training program, and provides participating EMTs and Paramedics with continuing education that they must fulfill in order to maintain their certifications. 28 Paramedics and EMTs participated in the training. 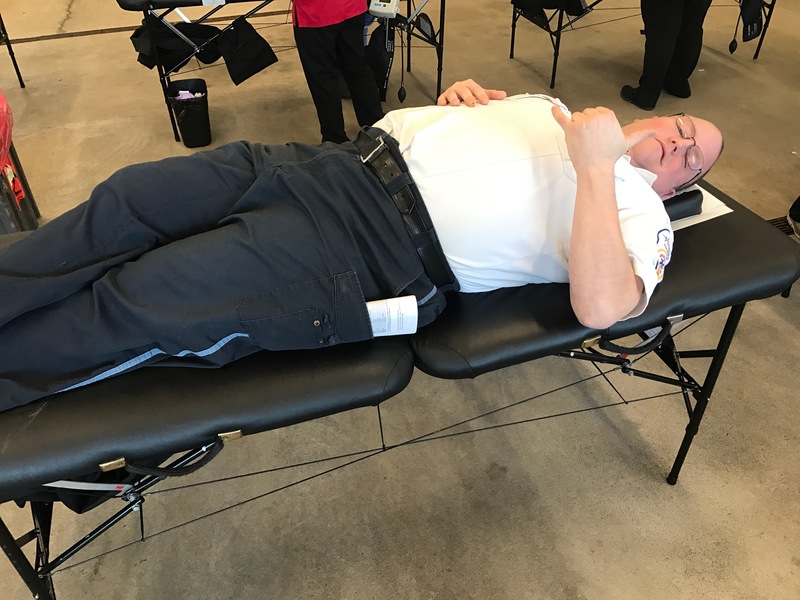 Armstrong Paramedic Nick Henderson practiced performing CPR on a K-9 mannequin. Armstrong EMT Wendy Wolleger practiced performing CPR on a K-9 mannequin.